There's a new go-to for brews and burgers in downtown Salt Lake City. It doesn't take much to convince me to try out a new burger joint—if you build it, I will come. 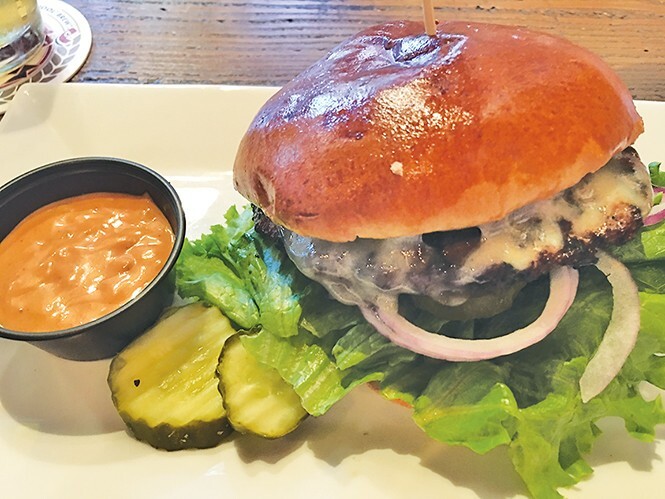 The search for the perfect hamburger is never-ending, but I am more than happy to make it my mission, thus my recent visit to downtown Salt Lake City's new Fat Jack's Burger Emporium & Tap House. The eatery is located on the ground floor of the Holiday Inn Express. It's a space that was home to many less-than-memorable cafés and restaurants (remember Luke's Café? Didn't think so). But so far in its early run—it opened at the end of April—the restaurant seems to have staying power. The first thing to know is that there is no Jack, fat or otherwise. An employee told me, "It just sounded like a catchy name." So, don't claim to know Jack, because you don't. The second thing, is that it's as much about brews as it is burgers. Beer lovers flock to this emporium to make hay with the vast array of suds. There are 16 on tap, and more than 80 by the bottle (including 11 low-points), ranging from several local Mountain West ciders and Epic beers, to Boddingtons Pub Ale, Mickey's Malt Liquor and Unibroue Maudite. You'll find something for everybody, including a respectable wine list, in addition to freshly made milkshakes. The peanut butter-banana shake ($5.50) is a must. But about those burgers. You have to love the philosophy here, which is to use as many local products as possible in an effort to support area farmers and artisan food producers. There is also an attempt to source only natural and organic ingredients. So burgers are made with non-GMO produce, hormone-free, grass-fed Niman Ranch beef and Heber Valley Artisan Cheese. Buns are baked just a couple of blocks away at Vosen's Bread Paradise. The fried chicken is free-range and the pastrami is house-cured. It takes extra effort and higher costs to produce such top-quality fare, so it was a pleasant surprise—in this day of the $18-$25 burger—to find that the offerings here are all under $10. A basic burger (called the Classic) is $7.59, and includes a wide array of free fixings. You can choose from 11 burger options, including the pastrami ($9.29), the Angry Bleu ($9.29) and the Seoul with kimchi and sriracha ($8.29). I come from the Anthony Bourdain "less is more" school of burger construction. Cheese, yes. Bacon, sometimes. Fried egg, OK. A slice of tomato and lettuce, if you must. Grease is desirable. The bun ought not outweigh the meat. The aforementioned Classic certainly fits the bill. The great beef patty served on a perfectly sized, glistening bun. The quarter-pound patty was too thin to be called juicy (our server didn't ask how I wanted it cooked), but it was very flavorful—enhanced with nothing more in my case than red onion, lettuce and cheddar. Perhaps it wasn't perfect, but it wasn't far off, either. By contrast, the veggie burger was a plump, pleasing and probably three times thicker than the Classic. My wife was thrilled to be given the option of a gluten-free bun. Bonus round: If you're a fan of twice-cooked french fries, Jack's has you covered: They are superb, especially with a cold one to wash it down.